Availability: Now! Just came out on Tuesday! Summary: Amara is never alone. Not when she’s protecting the cursed princess she unwillingly serves. Not when they’re fleeing across dunes and islands and seas to stay alive. Not when she’s punished, ordered around, or neglected. Review: At first glance, the premise of this novel seems like it could be confusing and have the potential to go dastardly wrong. I’m thrilled to let you know that in fact, the opposite happens! You can’t put this book down. My plan was to read the book slowly over a series of nights and instead I ended up staying up way too late to finish it. Corinne Duyvis knocks it out of the park with this amazing debut of a novel. Both Nolan and Amara are instantly likable characters that the reader is able to connect with, despite their extreme differences. Because of his connection to Amara, Nolan’s life is in constant flux and poor guy cannot get a break. In fact, he has lost a leg because of his connection to Amara and his family believes that he has seizures, when in reality he is in Amara’s world. Amara is a servant to a princess on the run, and she is actually mute, and communicates using sign language. Despite their disabilities, both Nolan and Amara are like action heroes, really. Once Nolan figures out how to “chat” with Amara, they work together to solve a mystery, so to speak, putting both their lives at risk. I find that characters who make the choice to be heroes are braver than the ones who are “destined for greatness”. Both Nolan and Amara fit into the description of the former and do not let their disabilities to hamper their goals in any way. For me, while the novel is a fantasy, the way Nolan’s and Amara’s disabilities were presented, as more background and just how they get about in the world, is realistic. 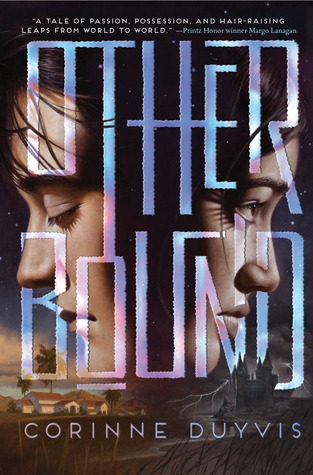 I loved that this novel was not about them overcoming their disabilities, but more about the mystery of how Nolan and Amara, people from two different worlds, connect and overcome an oppressive government. Another aspect of the novel I loved, and why Corinne’s book is so enjoyable, is how she writes the narration. The story is told from both Nolan’s and Amara’s point of view, which could be confusing especially when Nolan blinks and/or is with Amara. The way Corinne chose to break down those moments is what makes the novel interesting. The novel is particularly from Nolan’s point of view, and when he is drawn from Amara as some moments, you scream in frustration with him. When Nolan is fully with Amara, then the novel is in her point of view. The transitions between the two points of view is seamless and pulls the reader into the story. I can honestly say it was one of the reasons why I stayed up too late reading. Both voices are strong and like I said earlier, I was able to really connect with Nolan and Amara. Lastly, the world that Corinne creates, Amara’s world, is just a diverse and real as our world. It was a foreign place, a unique world all it’s own, but there was hints of our world dropped in here and there. A reason exists for those small hints and the explanation given is just…you have to read the book to find out! Mrs.Marsh!!! I want to read this book really bad now. After reading this review, it was so interesting, that i want to know more of the book. I guess I’ll read it some day.